San Francisco Public Defender speaks at a rally in front of the criminal courthouse. SAN FRANCISCO —More than 200 public defenders and allies held a “hands up, don’t shoot” protest Dec. 18 on the steps of San Francisco’s criminal courthouse to show support for racial justice and stand in solidarity with protesters in New York, Ferguson and around the country. While San Francisco public defenders rallied outside 850 Bryant St., public defenders in Alameda, Contra Costa, Santa Clara and Solano counties staged similar actions at their county courthouses. Speakers included Cephus Johnson, uncle of Oscar Grant and founder of the Oscar Grant Foundation; Deputy Public Defender Chris Hite, co-chair of the San Francisco Public Defender’s Racial Justice Committee, which organized the rally; and Yolanda Jackson, executive director of the Bar Association of San Francisco and the executive director of the Justice & Diversity Center. The Racial Justice Committee was formed in 2013 to address racial disparities in the criminal justice system and to advocate for reform in police detentions and arrests, prosecutorial charging and sentencing. The committee has partnered with the University of Pennsylvania Law School’s Quattrone Center to study the impact of race on the criminal justice system in San Francisco. 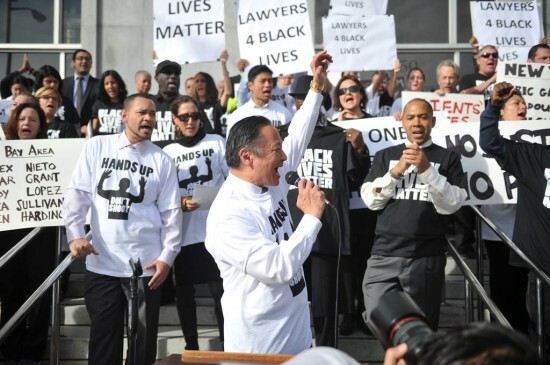 San Francisco Public Defender Jeff Adachi called for accountability on behalf of victims of racial profiling and police brutality. Jackson said lawyers will be key to bringing about change. The Racial Justice Committee is currently working on a plan for police department reform in light of the recent spate of unarmed black men around the country.